What Hidden Talents Could Your Gift Reveal This Christmas? My name is Anna, I’m an Occupational Therapy Art Technician at The Royal Hospital for Neuro-disability. This is the Art Room and it’s where I work, helping patients who have had a brain injury or who live with a neurological condition. The Art Service is available to over 300 patients every year, helping them to improve their co-ordination, upper limb strength, and fine motor skills; the kind of abilities you need to brush your teeth, fasten your coat buttons or open your Christmas presents. But art isn’t just a vital tool in a patient’s physical rehabilitation; art can help patients to build a new identity and a sense of self-worth. What I enjoy most about working with patients is seeing their pride in their achievements. From drawing a straight line to making a painting that’s exhibited, art can bring genuine joy to patients in desperate need of a boost to their confidence. Every Thursday we also have an art group for patients who enjoy art as a hobby, and this year they are making Christmas wrapping paper, which they are selling to raise money for the Art Room. These group sessions foster a real sense of community at the hospital. Patients are supported by trained volunteers; friendships are formed and group projects, like the Christmas wrapping paper, provide a shared experience where patients with different levels of ability collaborate and have fun together. 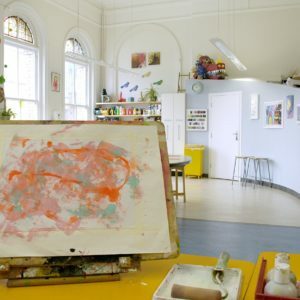 The Art Room at The Royal Hospital for Neuro-disability is a beautiful, calm space where patients can spend time away from the clinical environment, but sadly it doesn’t receive any funding from the NHS, so every year we have to raise £50,000 to offer this wonderful service. Our patients are enjoying doing their bit. They have already raised over £200 from the sale of their wrapping paper. This year I hope you’ll join them in showing your support. What many people fear about living with disability is that their life will be diminished by it. Your gift will ensure our patients can enjoy the benefits of art. It’s that simple. Thank you for considering the good you can do with a donation this Christmas. Whatever amount you can afford today will make a huge difference.